The ever-energetic and multi-talented GRIP Boiz team up with Loopy Records songstress Ruby to deliver a noteworthy performance on this summer’s anthem titled the ‘Bravitude Anthem’. 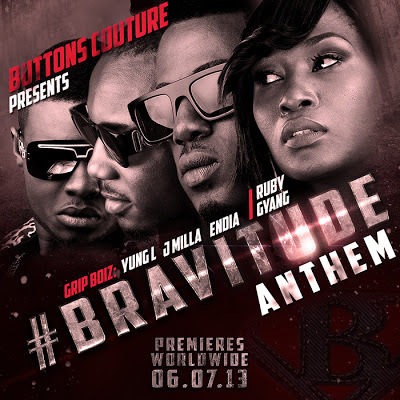 Produced by seasoned hitmaker Bigfoot of Micworx, Bravitude Anthem serves as a curtain-raiser in preparation for the official launch of Buttons Couture’s highly anticipated 2013 collection titled ‘Bravitude’. Over dark, solemn keys and accompanying martial drums, the trio of Yung L, Endia, and J Milla extol the virtues of possessing characteristics such as courage, vision, drive, and focus – attributes which have become synonymous with the Bravitude collection over a the course of a much buzzed-about campaign, which has seen Buttons Couture take its place as the breakthrough fashion brand of 2013.